The Minerva Software suite provides state of the art functionality for both our citation & diligence and collection activities. This has been enhanced by combining and adding to Minerva with the following range of web technologies. It can be difficult to organise structured training sessions if for no other reason than gathering people together at one time in a busy office is not always easy. Alex M Adamson has now invested in new technology that allows us to deliver training directly to your desktop. As long as you have an Internet and telephone connection we can deliver presentations direct to your PC. There is no limit to the number of people that can listen in to these presentations. An added advantage is that the sessions can be recorded and viewed again at a later date. We can provide training as requested on any aspect of citation and diligence or the recovery process. Guidance can also be given on the use of Web Minerva our on-line case monitoring and reporting system. Web Minerva is our on-line access system allowing clients to view all details on their cases on a secure server in real-time. Up to date information is available to clients without the need for telephone or e-mail contact. A further benefit is that information can be sent by the client via Web Minerva again sidelining the necessity of a call or e-mail. The full benefits of the system are as follows. Enables ordering of copy documents. Facilities are also available to instruct us on-line with consequent time saving. Enables checking of balances to include all chargeable sheriff officer fees. Upload documents to cases within AMA system with consequent saving in time and postage. 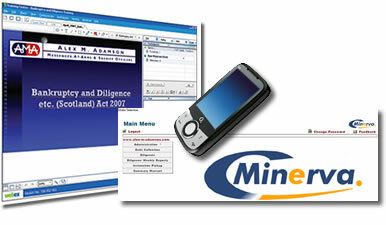 Minerva software has been adapted to run on PDAs used by our officers on the road. This enables them to record execution details for synchronisation with the main Minerva system. This can be done either in office or via a web connection. Recording details in a form based system increases accuracy. Synchronisation whether in-office or web based speeds up the process of production of executions enabling us to offer a second to none turnaround rate.